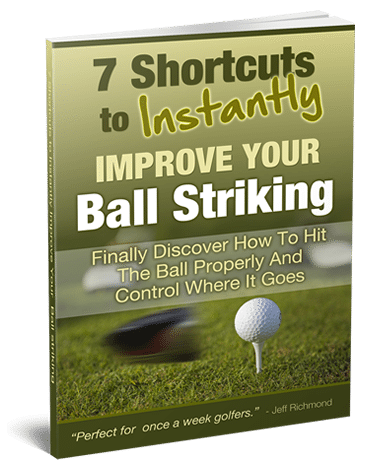 What I’m about to share with you could make golf so much easier and less stressful for you. Especially if you struggle with chipping and pitching. So grab a beverage of your choice and read this like your golf life depends on it (maybe a bit dramatic, but read and then try what I have to say because you may just find it to be the case). At the very least, see the animated GIF I created below. If you contact the ball thin or fat then you get bad shots. And bad short games shots leads to higher scores. Now using the old way of hitting chips and pitches with a lot of weight on the left side and using a sharp descending blow is very, very hard to time perfectly. Because if you play chips and pitches like that your contact has to be perfect (just ask Tiger). Have the ball positioned in the middle to forward in your stance. Have your weight evenly distributed at setup. Have your feet quite close together. Square stance (or even closed) NOT open. Have the shaft positioned so it’s vertical NOT leaning forward. Ball positioned back in your stance. Most of your weight on your left side. So how should you swing to use the bounce on your wedge? Well, I think you should forget about the term “use the bounce” altogether, because the word “bounce” conjures up images of your club bouncing off the ground, and you most certainly don’t want that on your short game shots UNLESS your contact is perfect. With this new way of chipping/pitching the idea is to have a very shallow angle of attack. So here’s the HUGE thing you can learn from that GIF. 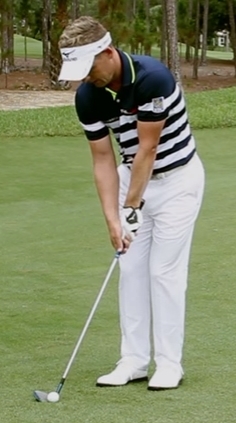 The club contacts the ground at least 2 ball spaces back from where the ball is. 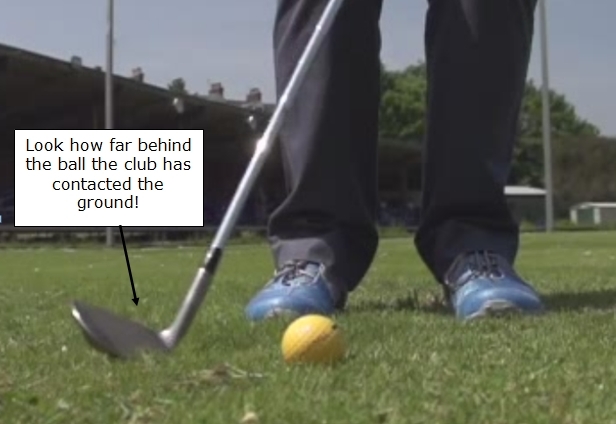 Here’s a picture clearly showing when club comes into contact with the ground. 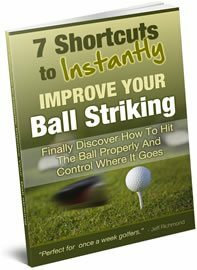 It means you don’t have to contact the ball perfectly to hit great short game shots. Instead your club can come into contact with the ground anywhere up to 2 balls behind where your golf ball actually is AND still hit good short game shots. ….the only way that is going to happen is if you have a very, very shallow angle of attack into the golf ball. And I’m going to now tell you how to practice this. If you have struggled with chipping and pitching this drill is going to be game changing for you. Ok, so here’s what you need to do. Get a plastic ball marker and place the ball marker 2 balls behind the golf ball you’re going to hit. 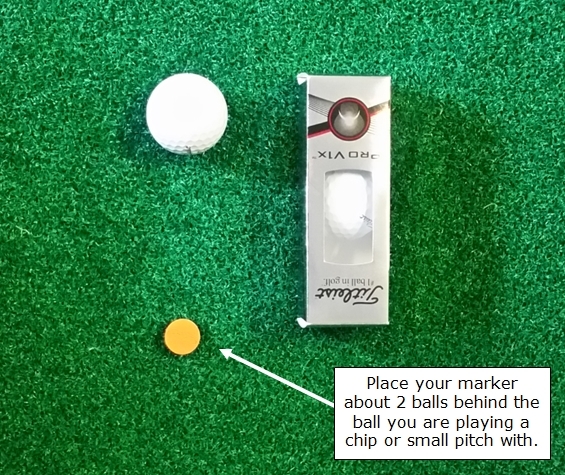 In the picture below I have placed a 3 ball box next to the ball, as that gives a very quick and easy guide as to where to place the marker. By the way, you can use a coin or a metal ball marker of some sort. I just like the plastic ones because they don’t interfere with contact on the ball at all, whereas the metal ones can almost get in the way. Do this initially with a wedge and give yourself a nice, fluffy lie. This two balls back placement of the marker is a guide. When playing shots from a bare/tight lie the club will have to come into contact with the ground closer to the ball. But the principal of swinging very shallow into the ball is still the same… no matter what the lie is, apart from a few exceptions. Naturally if you’re in very, very thick rough then you’re going to swing down steeply. The shots I’m talking about are the chip and pitch shots around the green that should be relatively easy. And the pros make them look easy, but most amateurs screw them up. you want to contact the ground right where your ball marker is so you sweep that away and your ball will then get in the way. It’s a very shallow angle of attack with much more of a sweeping motion. See this is all about training yourself to swing down on a very shallow angle of attack so at impact your club shaft is vertical, NOT leaning forward. When you do that your contact on the ball will be so much more consistent. Your confidence will sky-rocket because you know that you have so much room for error. How good is that going to be? The reason I’m doing this is because even though the advice in this article will give you so much more short game confidence, it still won’t necessarily mean that you’ll up and down the ball a lot more. Because up and downing the ball more is dependent on you hitting your shots a lot closer to the hole. And although I’ve given you some super helpful advice today that will help you to contact the ball better, it won’t guarantee that you get the golf ball consistently closer to the hole. Because there is one crucial element needed for a great short game that is not so much technical or mental…. and a few years ago I discovered this when I was trying to sort out my own short game issues. Since that time I’ve heard great pro after great pro talk about this one secret. But my program is the only one that focuses on it. So what I’ve given you is a great start and it will help you to have a lot more confidence in your short game shots because you’ll have better contact. But to be able to up and down it consistently will require my one short game secret that I discovered a few years ago. And today I’m releasing a great special on this program that you can learn about by clicking here. So if you want to finally impress your playing partners with your short game and get a lot more gimmies go here to get it on special now.